Normal function of the shoulder and arm is vital for completing activities of daily living and popular sports. A reduction in shoulder and arm function can lead to a lowered quality of life. Our physiotherapists provide comprehensive assessment and treatment of common shoulder and upper limb pathologies. An initial assessment with one of our specialised physiotherapists will look at your current symptoms, movement and muscle strength. Acromio-clavicular (AC) joint dislocation is when the joint between the clavicle (collar bone) and acromian (shoulder blade) becomes displaced or shifted due to damage to the ligaments that join the two bones. What causes AC joint dislocation? This injury can be caused by falling on your shoulder, elbow or outstretched arm. Types of AC joint dislocation? 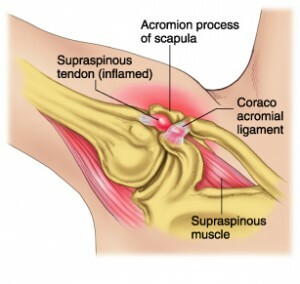 Type I – This is only a mild sprain of the acromioclavicular ligament with an intact coracoclavicular ligament. Type II – This inloves a tear in the acromioclavicular ligament and may involve damage to the coracoclavicular ligaments. 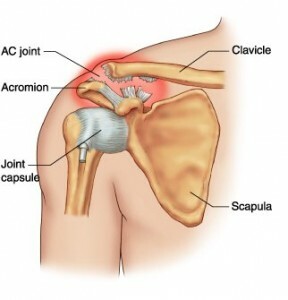 Type III – The acromioclavicular joint capsule and coracoclavicular ligaments are both torn. Type IV – This is a type III injury with avulsion (breaking) of the coracoclavicular ligament from the clavicle, causing the clavicle to move posteriorly. 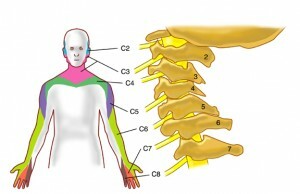 Type V – This is type III but with more movement of the clavicle. What are the symptoms/effects of AC joint dislocation? Symptoms include pain at the end of the collar bone or when you move your shoulder joint, especially with the arms above your shoulders. Dependent on how severe the injury is, you may experience some swelling and also feel a little bony lump where the collar bone sticks up. Physiotherapy treatment for AC joint dislocation? Treatment at Platinum Physiotherapy, will initially help to relieve your pain and swelling and improve your function and return to sports in the long term. Your rehabilitation program will be tailored to you and depend on the severity or grade of the dislocation. Our Physiotherapists provide comprehensive assessment and treatment for people with AC joint dislocation. People with undisplaced injuries will require physiotherapy for approximately 6 weeks. Major dislocations may require surgical stabilisation, in which case physiotherapy will be involved in promoting your recovery following your operation. A sling may be used initially after the injury to promote healing. Physiotherapy treatment is vital after your shoulder has been immobilised for a few weeks to get the arm moving effectively and return you to your sporting or everyday activities as soon as possible. Our specialised physiotherapists will restore your range of movement, muscle strength and function in order to return you safely and as quickly as possible back to sport or everyday tasks. What is a fractured clavicle? A fractured clavicle or collar bone is a breaking or splintering of the collar bone (the bone that runs along the front of the shoulder to the breast bone, located just below your neck). It is the most commonly fractured bone in the body. What causes a fractured clavicle? You can fracture your collar bone if you fall badly onto an outstretched arm or fall on the shoulder. A collision when doing contact sports such as rugby can also cause a fracture. Collar bone fractures are usually as a result of a physical injury and the bone most often fractures in its middle third. What are the symptoms of a fractured clavicle? There are various symptoms of a fractured collar bone, but if a fracture occurs you will usually know about it as it’s very painful. If you suspect you may have broken your collar bone you should see your GP or local A&E immediately who will confirm a diagnosis. You may then be provided with a sling to rest the affected area. There are various types of slings available, most common been what is referred to as a ‘figure of eight’ splint. A person with a fractured clavicle will benefit from physiotherapy. Physiotherapy treatment at Platinum Physiotherapy will help rebuild your muscle strength and flexibility in a safe and effective way. 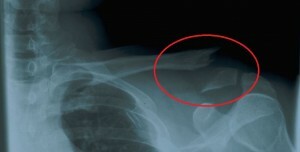 A fractured collar bone will take between four to eight weeks to heal. Your physiotherapist will ensure that pain and swelling is reduced before commencing a structured rehabilitation program tailored to your needs and physical activity, to ensure you make a full recovery as soon as possible. 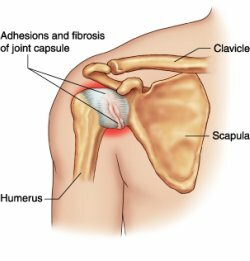 A frozen shoulder or adhesive capsulitus is inflammation of the connective tissue surrounding the shoulder joint which causes pain and stiffness and affects the ability to move the shoulder. Frozen shoulder reduces normal movement in the shoulder joint and, in some cases, it can prevent movement in the shoulder altogether. Frozen shoulders affect around 3% of the population and are slightly more common in women and those who suffer from diabetes. Other systemic conditions – heart disease and Parkinson’s diseases have been associated with an increased risk of developing a frozen shoulder. Pain and stiffness in the shoulder joint, pain at night when lying on the affected side and limited range of motion. It can take between two – three years for all these phases to occur. In younger people who are active, the whole process can sometimes be reduced to as little as 10 – 12 weeks. A frozen shoulder can be diagnosed on examination by a physiotherapist. An X-Ray is occasionally taken to confirm that there are no other problems or possible causes for the shoulder pain. At Platinum Physiotherapy, our specialised physiotherapists are experienced at assessing and treating people with a frozen shoulder. Physiotherapy treatment will promote recovery and ensure you get your shoulder moving normally so you can continue with everyday activities with independence. Advice about cortisone injections (used to decrease the inflammation in the frozen shoulder joint and help reduce pain. They also help allow more agility when stretching and exercising. Cortisone is only effective when used in conjunction with physiotherapy). Physiotherapy treatment will keep your shoulder joint mobile with regular exercise tailored to you and improve pain, stiffness and functional ability. Pain is commonly referred to the shoulder and upper arm from other areas of the body. Dysfunction within the neck frequently causes referred pain to the shoulder region. Our physiotherapists at Platinum Physiotherapy commonly assess and treat people with referred pain. Your physiotherapist will conduct a thorough assessment to understand the nature of your referred pain and develop an individualised treatment program to get you back to a level you were previously, as soon as possible. The rotator cuff is a group of tendons and muscles that hold the ball of the shoulder joint in place and provides mobility and strength. The rotator cuff muscles are an overlapping series of tendons and these can become torn leading to pain and restricted movement of the arm. A torn rotator cuff can happen following a trauma to the shoulder or just through ‘wear and tear’. 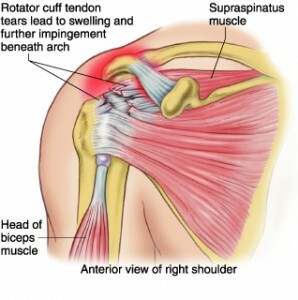 A rotator cuff injury can be caused by repetitive throwing and strain of the muscles or general degeneration which normally affects older people, smokers, or those having had cortisone injections Many athletes, like pitchers in baseball and javelin throwers, suffer of such injuries due to the repetitive movement of their shoulders. At Platinum Physiotherapy we have specialised physiotherapists who will provide individualised assessment and treatment for your rotator cuff injury. Contact sports and hitting your shoulder hard against a solid object can dislocate the shoulder. An anterior dislocation is the most common shoulder dislocation, when the top of the humerus (arm bone) shifts and sits in front of the shoulder blade. If you suspect you have dislocated your shoulder you should seek medical treatment immediately to prevent further damage to the shoulder. Your GP or A&E doctor may treat your dislocated shoulders by manipulating the shoulder back into place. This is usually followed up with an x-ray to ensure the shoulder has been put back into place properly, and no other bones were fractured around the shoulder as a result of the manipulation. Your arm will then be placed in a sling for several weeks to help your shoulder recover. Physiotherapy at Platinum Physiotherapy following your shoulder dislocation will gradually restore the range of motion to the shoulder and strengthen the muscles around it, to prevent re-injury and return you to your everyday activities and sports. Your physiotherapist will initially assess your range of movement, muscle strength and function after your sling has been removed, in order to develop a progressive treatment program to help you get back to the level you were previously. Your physiotherapist will help you return to the activities you enjoy as soon as possible, by regaining pain free range of movement and strengthening your shoulder muscles in an exercise program suited to you and your hobbies. Shoulder Impingement is the most common shoulder problem and happens when the rotator cuff tendons get trapped in the shoulder joint causing pain, weakness and loss of function. 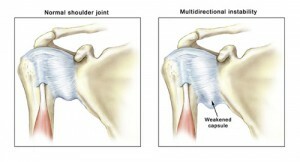 Overuse causing irritation of the structures in the shoulder joint. This is a common injury in swimmers, throwers, racket players and sports people who make repetitive movements with their arms above their shoulders. Bony anatomical factors such as bone spurs caused by wear and tear of the joint between the collarbone and the scapula, called the acromioclavicular (AC) joint. A diagnosis of shoulder impingement can be made by a physiotherpaist or doctor. Your physiotherpaist or doctor will ask you detailed questions about your activities and conduct a thorough assesment to confirm a diagnosis. What are the effects/symptoms of shoulder impingement? Pain in the shoulder when the arm is lifted above the shoulder, forwards and upwards. Physiotherapy treatment at Platinum Physiotherapy will improve the strength in the muscles of the rotator cuff to help control the stability of the shoulder joint and decrease impingement of the rotator cuff tendons. Shoulder instability occurs when the structures that surround the shoulder joint do not work to hold the shoulder in the socket. If the joint is too loose, is may slide partially out of place, a condition called shoulder subluxation. If the joint comes completely out of place, this is called a shoulder dislocation. People with shoulder instability often complain of an uncomfortable sensation that their shoulder may be about to slide out of place. Causes of shoulder instability may include injury such as a shoulder dislocation. Following trauma the shoulder joint often remains unstable as the ligaments and cartilage that maintain the shoulder in the socket have become stretched or torn. In other cases, athletes such as volleyball players and swimmers, who do repeated shoulder movements may gradually stretch out the joint capsule making the shoulder muscles weak and causing the ball of the humerus to slip around too much within the shoulder. Eventually this can cause irritation and pain in the shoulder. Shoulder instability may be forwards (anterior), backwards (posterior), downwards (inferior) or multidirectional. Anterior instability – may be caused by either trauma, causing a dislocation, or atraumatic with a gradual onset. This type of instability is treated with an intensive rehabilitation program focusing on the strengthening of the rotator cuff muscles and scapular stabilising muscles. Posterior instability – is most commonly seen in athletes. It is treated with strengthening and control exercises for the posterior stabilising muscles. Multidirectional instability – is a combination of instabilities and is usually atraumatic. Multidirectional instability is often associated with joint hypermobility syndrome but can also be caused by repetitive trauma. Treatment involves strengthening of the shoulder stabilising muscles. A physiotherapist or your GP can diagnose shoulder instability primarily through your medical history and a physical examination. Your doctor may order an X-ray to help confirm that your shoulder was dislocated or injured in the past. What are the symptoms/effects of shoulder instability? Subluxation – when the shoulder slips in certain positions, and the shoulder may actually feel loose. This commonly happens when the hand is raised above the head, for example while throwing. Frequent dislocations – this is usually very obvious and painful and the shoulder looks abnormal. At Platinum Physiotherapy, we provide specialised physiotherapy treatment for people with shoulder instability. Physiotherapy for shoulder instability will strengthen the muscles around the shoulder joint and help maintain the shoulder in a proper position. Our physiotherapists integrate a global approach to rehabilitation incorporating the person’s whole body. Your rehabilitation program will be developed following an initial assessment and tailored to you, to ensure you get the most out of your treatment. Our rehabilitation focuses on the strengthening of scapula stabilising muscles and shoulder stability muscles. This is achieved with closed chain rehabilitation, rotator cuff strengthening, plyometrics and proprioceptive exercises. Your rehabilitation program will also be functional and specific to your individual lifestyle. Physiotherapy treatment modalities used may include swiss ball exercises, medicine ball work, electrotherapy and rubber resistance band exercises. What is a bicep muscle tear? A bicep muscle tear is a condition characterised by tearing of one or more tendons or muscle bellies of the bicep muscle and caused by stress and pressure on your biceps, which results in pain and weakness. What causes a bicep muscle tear? A biceps muscle tear is caused by sudden or excessive contraction of the biceps muscle. This commonly affects weightlifters and other athletes that forcefully use the arm, such as lifting weights overhead, forceful arm elevation activities or bending of the elbow against resistance (such as performing chin ups or biceps curls). A biceps muscle tear may also be caused by gradual trauma associated with repetitive or prolonged activities placing strain on the biceps tendon. If you suspect you have torn your bicep a thorough examination from your GP or a physiotherapist will confirm a diagnosis. Further investigations such as an X-ray or MRI may also be required to rule out other injuries. What are the symptoms/effects of a bicep muscle tear? Physiotherapy treatment at Platinum Physiotherapy is vital to promote the healing process, ensure an optimal outcome and reduce the likelihood of future injury. Your rehabilitation program will be suited to you which will emphasise a graded return to activity to ensure you make the best possible recovery. What is a tricep muscle tear? 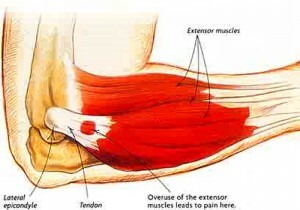 A tricep muscle tear is inflammation of the tricep muscle caused by tearing of the muscle belly or tendons. A tricep muscle tear is likely to occur when the tricep muscle is placed under pressure but can also be caused by repetitive movements, such as throwing. Tricep muscle tears are common is athletes that lift heavy weights without warming up correctly. What causes a tricep muscle tear? A tricep muscle tear is caused by stress placed on the tricep muscle and commonly affects weightlifters and other athletes that forcefully use the arm, such as lifting too much weight or straightening the elbow against resistance. A tricep muscle tear may also be caused by repetitive strain on the muscle from prolonged activities which place gradual pressure on the tricep muscle, like throwing, hammering or playing tennis. A doctor or a physiotherapist will confirm a diagnosis of a tricep tear following a subjective and objective examination. Further investigations such as an X-ray or MRI may also be required to rule out other injuries. What are the symptoms/effects of a tricep muscle tear? Physiotherapy treatment is strongly recommended following a tricep injury to rebuild the strength and flexibility in the tricep muscle safely and effectively during your recovery. Your physiotherapist will advise and support you throughout your rehabilitation for the best possible outcome both in the short and long term. What is a rupture of the long head of the biceps? What causes a rupture of the long head of the biceps? Overuse or repetitive movement of the shoulder can cause inflammation of the tendon (tendonitis). Repetitive overhead sports, such as swimming or tennis can lead may increase the chances of the fraying and eventually rupture of the bicep tendon. 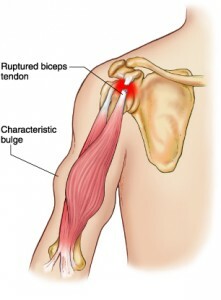 Injury such as a fall on an outstretched hand or lift something too heavy, you can rupture your biceps tendon. What are the effects/symptoms of a rupture of the long head of the biceps? Immediate symptoms may include hearing and feeling a pop or snap in the top of the shoulder followed by sharp pain. Soon afterward, bruising may develop in the middle of the upper arm and spread down to the elbow. The arm may also feel weak at when trying to bend the elbow or lift the shoulder. A thorough physical examination by your doctor or by a physiotherapist will confirm a diagnosis of a long head of bicep rupture. You may also have an X-Ray or MRI to see if there are any other problems with your shoulder. Physiotherapy treatment at Platinum Physiotherapy will relieve the pain and swelling and increase muscle strength and range of movement to help you return to activity sooner. Advice on how to rest your shoulder while it is healing and how to gradually return to activity without putting extra strain on the sore area. Exercises are used to gradually strengthen other muscles that help do the work of a normal biceps muscle. As you progress, your physiotherapist will teach you exercises to strengthen and stabilise the muscles and joints of the elbow and shoulder. Your exercises will work your arm in ways that are similar to your work tasks and sport activities so that you can return to these with confidence and success. Biceps tendinopathy is a term which describes pain and tenderness in the shoulder region due to degeneration and/or inflammation to the biceps tendon. This may occur traumatically due to a high force going through the biceps tendon such as lifting heavy weights or falling on an outstretched hand or due to gradual wear and tear associated with overuse. People with biceps tendinopathy experience pain in the front of the elbow which may increase with activity during activity such as carrying heavy shopping, performing biceps curls or chin ups. Occasionally people may notice swelling at the front of the elbow and experience weakness when attempting to lift objects. A thorough subjective and objective examination from a physiotherapist or doctor will diagnose biceps tendinopathy. Occasionally, further investigations such as an ultrasound, X-ray or MRI scan may be required to assist with diagnosis and assess the severity. Early physiotherapy treatment is vital to promote recovery and for long term success. At Platinum Physiotherapy, our specialised musculoskeletal physiotherapists will develop an individualised and graduated rehabilitation program to ensure an optimal outcome. Your physiotherapist will also advise you on the exercises most appropriate for you and when they should be commenced. Your physiotherapist will guide you through the best course of treatment in order to relieve your pain and improve your success with every day and sporting activities. What is a fractured shaft of humerus? 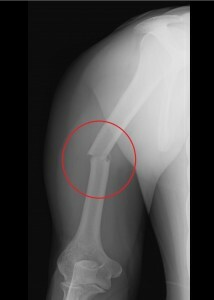 A fractured shaft of humerus is when the middle part of the bone in the upper arm (humerus) breaks. The humerus connects the shoulder to the elbow joint. A fracture of the humeral shaft involves damage to the humerus but may also affect the elbow and shoulder joints, and the soft tissue around the fracture site, including nerves, tendons, ligaments, and blood vessels. What is the cause of a fractured shaft of humerus? What are the symptoms/effects of a fractured shaft of humerus? Abnormal sensation over the back of the hand, and weakness of some of the muscles of the hand and wrist if the radial nerve is damaged. If you suspect you have fractured your arm you need to seek medical advice as soon as possible. You will usually have an X-ray to see the extent of your injury and to confirm a diagnosis of a fracture. Most people are then provided with a sling or brace, and with time the fracture will heal. Physiotherapy treatment is strongly advised following immobilisation in a sling or brace to help regain muscle strength and range of movement and get you back to the activities you enjoy. At Platinum Physiotherapy, physiotherapy will promote fracture realignment and healing and maximise function. The average healing time for this type of fracture is 6 to 8 weeks. Your physiotherapist will guide and support you through your rehabilitation program to ensure you get the most out of your treatment and gone to make a full recovery with every success in the long term. There are many activities that can cause Golfer’s Elbow such as working out at the gym or simply working in front of a computer for prolonged periods. These activities use the same muscles (wrist flexors and forearm pronators) repetitively and can result in the inflammation of common flexor tendon of the wrist where it attaches at the inside of the elbow. The causes of Golfer’s Elbow are similar to tennis elbow but pain and tenderness are felt on the inside of the elbow, on or around the joint’s bony prominence. Symptoms include tenderness and pain at the inside of your elbow, made worse by bending the wrist, grasping and turning the palm downwards (pronation). The pain may also spread down the forearm. . Your physiotherapist will advice and support you throughout your treatment to ensure you make the best possible recovery and go on to make long term improvements to prevent re-injury. Physiotherapy treatment will reduce pain and inflammation and promote healing so that you can get back to the activities you enjoy as soon as possible.